No Steps, No Stairs, Lawn care & snow removal are done for you! ! Single family home in an association. Awesome location overlooking a pond on the 18th hole of Village Green Golf Course. Perfect blend of privacy & convenience. Includes a cozy sunroom with a walk out patio. No Steps, No Snow, No Mowing, Fabulous Location overlooking a pond on the 18th Hole of Village Green Golf Course. Perfect blend of privacy & convenience. Single family home in an association. Lawn care & snow removal are done for you! Includes a Cozy sunroom w/a walk out patio. Open concept living & dining w/vaulted ceiling. Large master bedroom has recessed ceiling, big walk-in closet & Master bath. Kitchen with stainless steel appliances. Top Agents Jim Christl and Shannon Barnum in Fargo, ND have earned themselves a reputation for being the best real estate agents. Modern Market Realtors is your expert real estate agency in Fargo,ND. The sole purpose of our agents is to find what you are looking for at the best price and benefit from our trusted North Dakota agents. Totally Free & Unbiased. Based on Advanced Science. Its never too late to get started on that new home search. If you like watching real videos of homes for sale give our channel a try. 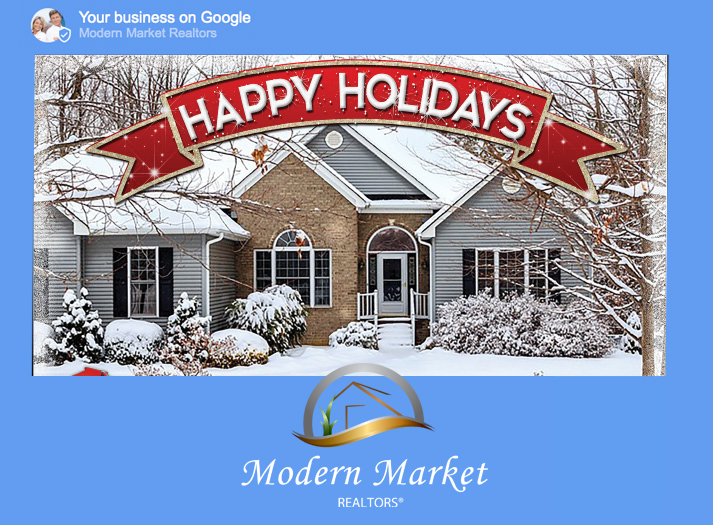 Modern Market Realtors put a lot pride in our videos and consider ourselves the YouTube Realtors in Fargo-Moorhead and West Fargo ND. So if your just getting started watch a few Homes for sale videos and get going on that home buying journey. Please take a min to Check out our NEW Youtube Channel. It will be filled with Homes for sale in the Fargo-Moorhead and West Fargo area. We take great pride in our work on youtube and hope to see you there. Please Like, and Subscribe. This home has NO STEPS in it. HOA paid Snow Removal and Lawn Care Included. Workmanship & quality are 2 things you get w/this meticulously thought out main level design. HOA handles snow & lawn care. 55 + Communities for sale in West Fargo ND. Workmanship & quality are 2 things you get w/this meticulously thought out main level design. 1822 sq' of main living featuring a private master suite, 2 add'l bedrooms, & an add'l bathroom. Kitchen comes equipped w/an island breakfast bar, stainless steel appliances, quartz counter tops, soft close pots & pans drawers that hold up to 100lbs each, convenient storage pantry & raised dishwasher. Sunroom, vaulted ceilings & open concept floor plan bring an abundance of natural light. To top it off the attached 3 stall garage includes natural gas heater & floor drain! Fully sodded yard included. HOA handles snow & lawn care. This design of home enhances main level living allowing rooms in the home to relate to one another with a natural flow maximizing space while minimizing effort to use it. Tired of Blowing Snow? Mowing Lawn? 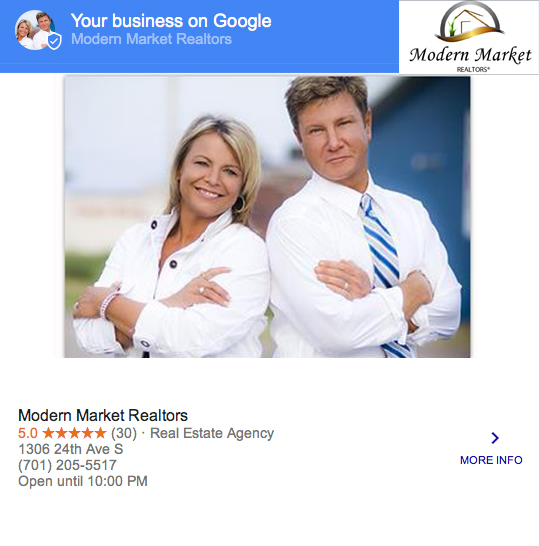 Modern Market Realtors Teams up with Eid-Co of Fargo ND. 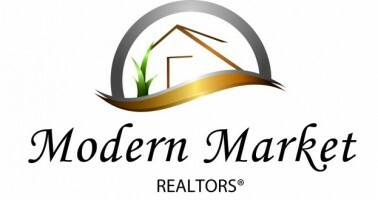 Modern Market Realtors Teams up with Fargo Home Builder Eid-Co of Fargo ND. Eid-Co Homes originally started as Eid Brothers Construction in 1951 and focused on building affordable homes for the soldiers returning from war. Today, under the leadership of 3rd generation builder, Jason Eid, Eid-Co Homes still works to provide affordable housing and home ownership to the community. Like many other cities in North Dakota, West Fargo has seen major gains in single family homes sales this year. 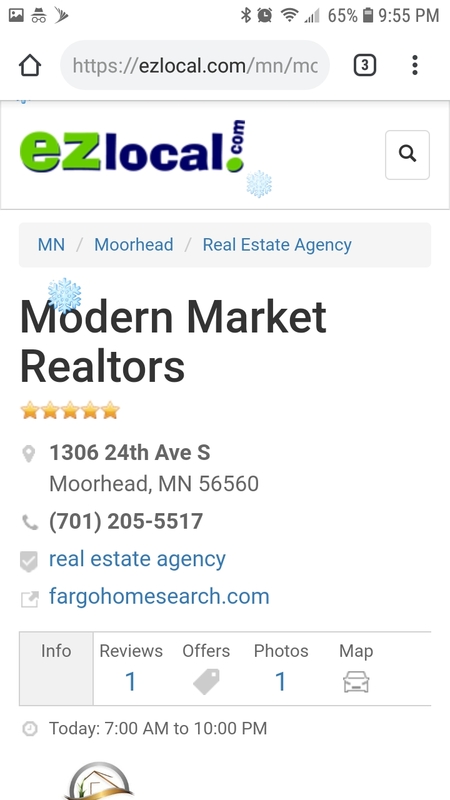 That means home sales are heating up ...West Fargo Real Estate Agents at Modern Market Realtors are here to assist you in buying or selling your home. Modern Market Realtors helping first time home buyers and sellers sell their home quick. Whether you are looking for new or existing homes for sale in West Fargo, let Modern Market Realtors guide you through your home search. See information about the housing market in West Fargo, ND, including average home prices, neighborhood statistics and real estate agents. If you find yourself in this scenario, trust us when we say that moving doesn't have to ruin your life or holiday fun. 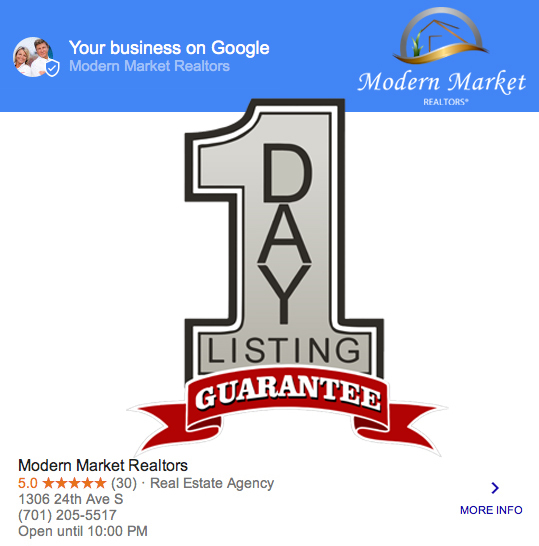 Modern Market Realtors approach makes buying or selling real estate easy, organized, and painless. Shannon Barnum handles residential sales throughout the Fargo Moorhead area. Fargo is known for friendly people and reasonable living costs and you’ve got an incredibly unique city that’s also a great place to call home. Making the decision to settle down in Fargo involves locating the ideal place to live, and the best way to find exactly what you’re looking for requires contacting one of the best real estate agents in the area. Top Rated North Dakota Realtors is Modern Market Realtors. Our Qualifications: We specialize in residential real estate transactions working with buyers and sellers in all types of real estate transactions. Super Real Estate Agents 2019. Fargo, and Moorhead's best Realtors for facilitating the home buying process based on client satisfaction. The North Dakota real estate market is being taken over by these incredible Realtors on social media. These Realtors have leveraged Facebook, Instagram, and other social media channels to expand their reach to thousands of people in North Dakota. When it comes to North Dakota real estate and social media, these Realtors are the best of the best. This is Modern Market Realtors FM Area Homes For Sale Facebook Page. Whether you are looking to buy or sell your home, Modern Market Realtors and their real estate agents and brokers in Fargo, ND connects you with professionals who can help meet your needs. Because the Fargo real estate market is unique, it's important to choose a real estate agent or broker with local expertise to guide you through the process of buying or selling your next home. Our real estate professionals who specialize in buying, selling, foreclosures, or relocation - among many other options. Alternatively, you could work with a the best local agent or real estate broker who provides an entire suite of buying and selling services. This is Modern Market Realtors Fargo Home Search Facebook Page. 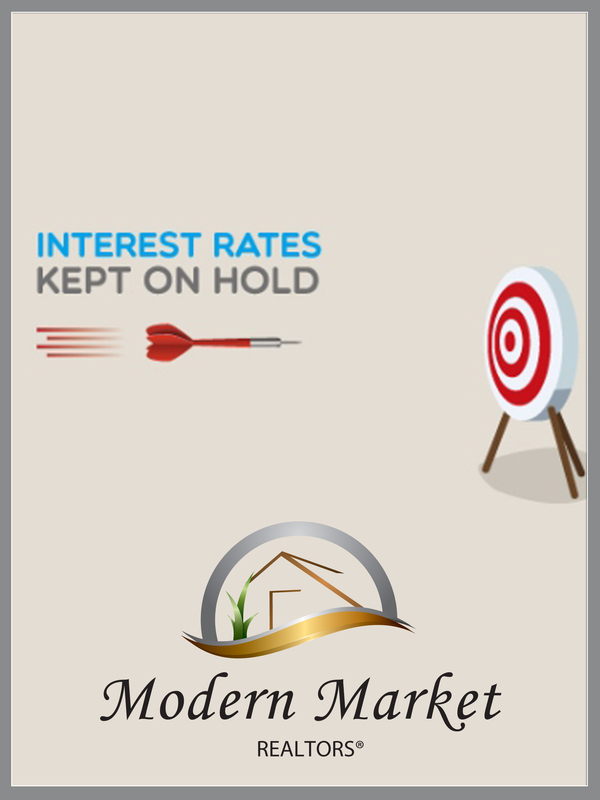 If your buying or selling a home in Fargo ND, call Modern Market Realtors. Because the Fargo real estate market is unique, it's important to choose a real estate agent or broker with local expertise to guide you through the process of buying or selling your next home. Our Fargo real estate professionals who specialize in buying, selling, foreclosures, or relocation - among many other options. Alternatively, you could work with the best local agent or real estate broker who provides an entire suite of buying and selling services. This is Modern Market Realtors Fargo Homes for SaleFacebook Page. 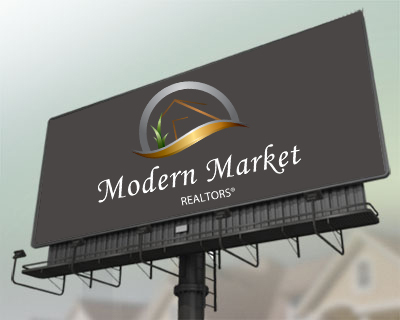 If your buying or selling a home in Fargo ND, call Modern Market Realtors. Because the Fargo real estate market is unique, it's important to choose a real estate agent or broker with local expertise to guide you through the process of buying or selling your next home. Our Fargo real estate professionals who specialize in buying, selling, foreclosures, or relocation - among many other options. Alternatively, you could work with the best local agent or real estate broker who provides an entire suite of buying and selling services. This is Modern Market Realtors Moorhead Homes for Sale Facebook Page. 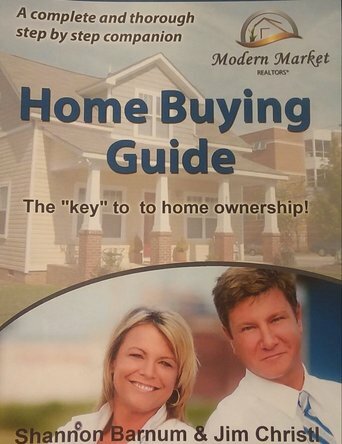 If your buying or selling a home in Moorhead MN, Call Modern Market Realtors. Because the Moorhead real estate market is unique, it's important to choose a real estate agent or broker with local expertise to guide you through the process of buying or selling your next home. Our Moorhead real estate professionals who specialize in buying, selling, foreclosures, or relocation - among many other options. Alternatively, you could work with the best local agent or real estate broker who provides an entire suite of buying and selling services. Whether you are looking to buy or sell your home, Modern Market Realtors and their real estate agents and brokers in Moorhead, MN connects you with professionals who can help meet your needs. Because the Moorhead real estate market is unique, it's important to choose a real estate agent or broker with local expertise to guide you through the process of buying or selling your next home. Our real estate professionals who specialize in buying, selling, foreclosures, or relocation - among many other options. Alternatively, you could work with a the best local agent or real estate broker who provides an entire suite of buying and selling services. Video: Super Real Estate Agents 2019. Fargo, and Moorhead's best Realtors for facilitating the home buying process based on client satisfaction. Google My Business for real estate is a big deal. 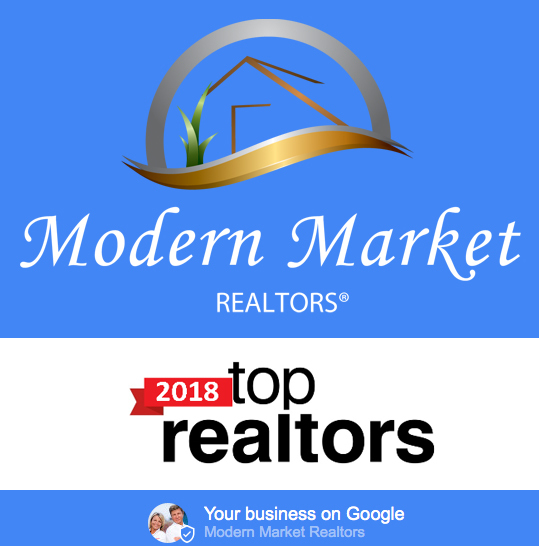 Modern Market Realtors takes our reviews very seriously, please take a few minutes to take a look at what clients have to say about our business practices. As small business owners, we pride ourselves on delivering a product that is second to none. However, there are many more facets to our brand than product. 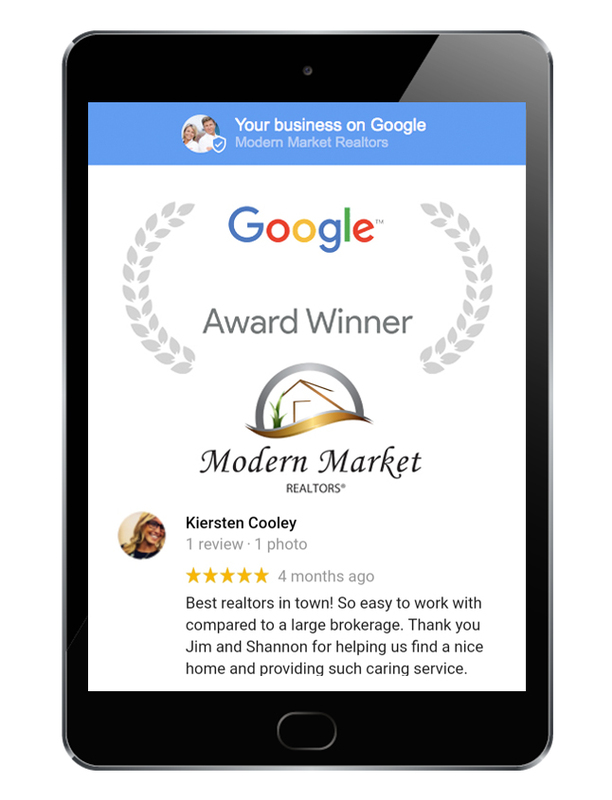 We consider ourselves Google experts and The Best Realtors in Fargo ND. Super Real Estate Agents 2019. Fargo Moorhead's best for facilitating the home buying process based on client satisfaction. 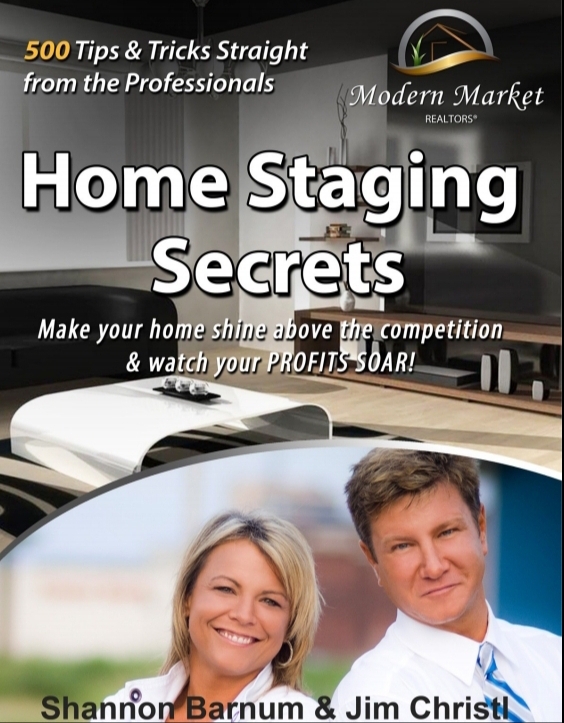 Find out why Modern Market Realtors hires a home staging company on every listing. Why not hiring a home stager will cost you $1000s. Take a few minutes to browse our Home Staging Secrets Guide. Filled with useful quick and easy tips. I will leav the link at the bottom. Heres a sneak peak at whats inside. 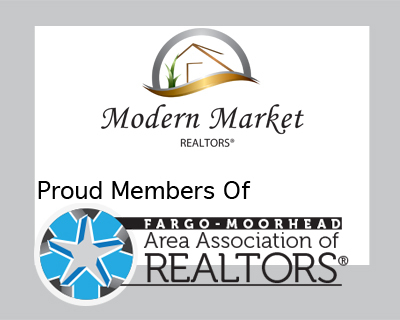 Modern Market Realtors are proud members of the Fargo-Moorhead Area Association-Realtors, 42nd Street South, Fargo, ND, USA. We have members since 2010 and love serving the Fargo Real Estate community. Modern Market Realtors are true professionals that really care about every real estate transaction. If your looking to sell a home or just wanna buy a home let us guide you thru the whole experience step by step. Check out our 5 Star reviews on goggle business and hear what past clients have to say about their real estate experience with us. Real estate is our life. Thanks for taking time to read and feel free to call our office and get started today with finding that new home. Coming soon to the fargo moorhead real estate community. Look for our new billboards in the Fargo, West Fargo area. We will have homes for sale and featured agent on the billboards. For more information on how your home for sale can be seen on the real estate billboard give Jim Christl a call today. (701)205-5517. 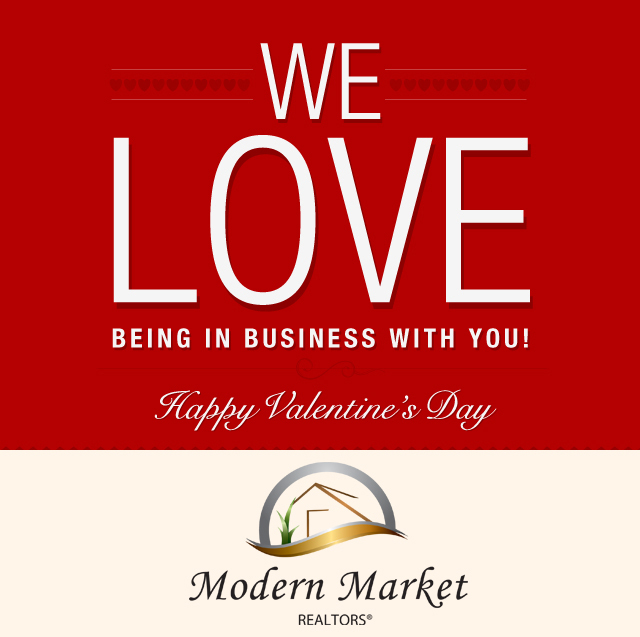 Have a Happy Valentines Day from Modern Market Realtors and all our clients. Check out the newest homes just listed in Moorhead MN. This guarantee is exactly what it sounds like. Unhappy for any reason? You, the property owner, can cancel your listing after 24 hours on the market. There is no long-term binding agreement that could potentially force you to sell your home even if you've decided not to move. 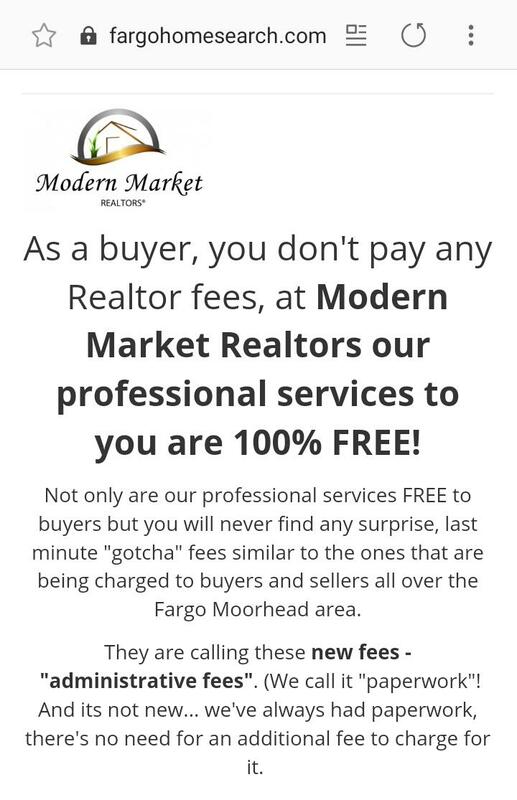 If for any reason you are not satisfied with our work at Modern Market Realtors you can cancel your Fargo or Moorhead Real Estate listing agreement. Have a great holiday Fargo real estate. Hopefully Santa brings you a new rambler complete w a 3 stall garage located in the most desirable location in the Fargo real estate area. 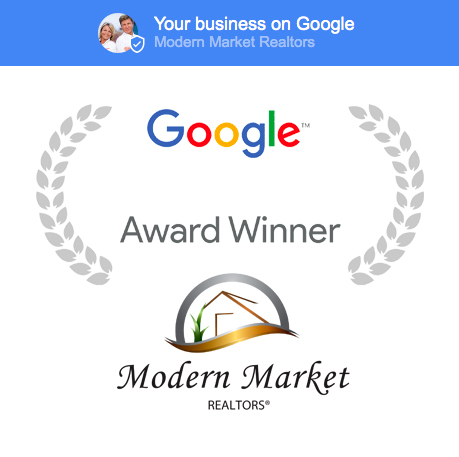 Thanks for helping Modern Market Realtors become a success in the FM area. We hope you enjoy your home search and look forward to showing you new homes in the future. If you have any questions about any homes in Fargo, Moorhead or West Fargo feel free to call or text. Please answer | What are specials or special assesments in Fargo Moohead home ownership? 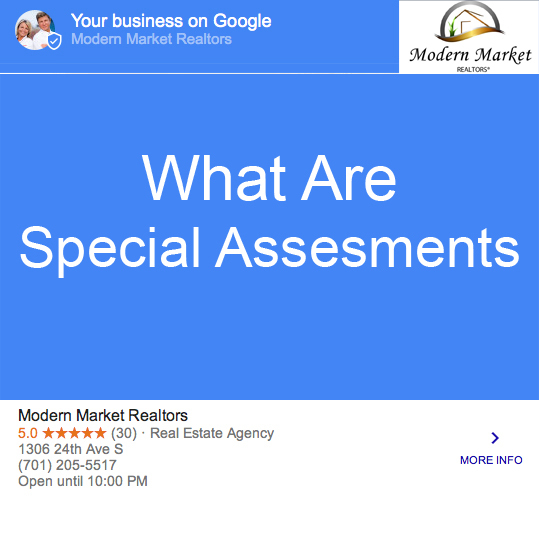 Here at Modern Market Realtors we get asked a lot, what the heck are specials on property and why does no other area of the country have them? If you grew up here you probably have heard of them but if not, it does seem very foreign. Specials are just another way these cities raise money to pay for all the extras that come when new neighborhoods are built or if work needs to be done in older neighborhoods. Most cities throughout just use local and state dollars raised thru taxation to support these projects, but not in the FM area. We have specials! Think of specials as nothing more then taxes, thats basically what it is. You can avoid the higher specials if you choose to live in a older more developed neighborhood. The new homes is where you really get hit with all those huge specials needed to pay for all new projects. If you really want to avoid paying high specials think older home. Market Update | Fargo Moorhead just seems to avoid those crazy ups and downs in the housing market. Fargo Moorhead Real Estate has always been an anomaly in the big picture of housing. The FM area which I have lived in for over 30 yrs, always seem to be anything but a bellwether for the market. Hmm what do I mean by that? Fargo Moorhead just seems to avoid those crazy ups and downs in the housing market. 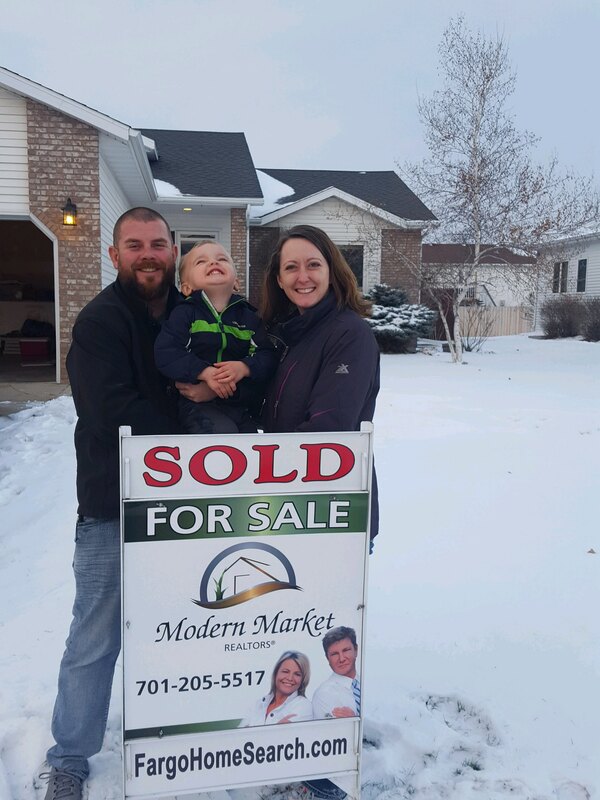 Jake and Lori Scott | Another happy home owner from Modern Market Realtors. Buying a home thats over 300,000 in Fargo Moorhead? Existing homes are the best bang for your dollar. If you are selling or thinking about selling a home for over 300,000 expect it to take awhile in Fargo Moorhead. One of the reasons is the amount of new construction being built in the FM area. A few years ago the home builders in Fargo Moorhead were playing catch up from the 2008 mess. Post 2008 we saw a lot of home builders either quit or find other ways to make a living. Now in 2017 with the large amount of new home building in the area and all the options new home buyers have in the market, its slowed down some of the existing home sales. Existing homes do have some benefits that bargain buyers should keep in mind. The biggest benefit is savings. Lets start with specials, all new homes here come with a hefty $20,000 to $100,000 in specials that must be paid by the buyers of those homes. The cost of the specials really varies from neighborhood to neighborhood. Most existing homes have very few or no specials. The 2nd advantage to buying existing over new construction is yard & landscaping. That might not sound like a huge benefit, but when you start adding this up, its a large chunk of change. Most new construction properties come with a yard that has "rough grade" which means thousands of dollars to add final grade, seed or sod not to mention any landscaping desired. Another benefit is appliances, most existing homes come with all appliances, most new construction homes do not. And the other expense that is another "add-on" with new construction is flooring and lighting. Most builders will give an allowance for these items but very few buyers can get the finishes within those allowances, once you shop for your lighting and your flooring, there is usually a hefty "upgrade" amount that is added to your home price. So, keep all these things in mind as you're shopping for a home. Other items that are additional expenses that can really add up later are decks, fences, sheds, sprinkler systems, trees, shrubs, bushes and numerous other options that may or may not already be in existing homes in your price range. One tip for shopping pricing of new or existing homes is to always add the unpaid specials balance to the price of the home to know the "true total price". For instance, if a new construction home is priced at $300,000 and has $45,000 in specials, the actual price of the home when you're comparing is $345,000. If an existing home is priced at $340,000 and has $5,000 in specials then the actual price is $345,000. Once you've determined the actual cost of the home including specials, you will want to compare homes priced at approx $20-30,000 less if its new construction to make room for all the add ons (more or less depending on your desires and quality of add ons). So, in this example, you would compare that $345,000 existing home to a $325,000 new construction home (assuming specials are included in that price). In a nutshell: If you find a new construction home that you really like and its priced at $350,000 and has $40,000 in specials, you will want to compare that home to existing homes priced around $420,000 or more to be comparing apples to apples. Hope this helps you make an informed decision when comparing new construction to existing homes! Modern Market Realtors NO Administration Fees or Hidden Fees!